Mood of Music is among the most relevant and commercially promising, yet challenging attributes for retrieval in large music collections. In this respect this article first provides a short overview on methods and performances in the field. While most past research so far dealt with low-level audio descriptors to this aim, this article reports on results exploiting information on middle-level as the rhythmic and chordal structure or lyrics of a musical piece. Special attention is given to realism and nonprototypicality of the selected songs in the database: all feature information is obtained by fully automatic preclassification apart from the lyrics which are automatically retrieved from on-line sources. Further more, instead of exclusively picking songs with agreement of several annotators upon perceived mood, a full collection of 69 double CDs, or 2 648 titles, respectively, is processed. Due to the severity of this task; different modelling forms in the arousal and valence space are investigated, and relevance per feature group is reported. Music is ambient. Audio encoding has enabled us to digitise our musical heritage and new songs are released digitally every day. As mass storage has become affordable, it is possible for everyone to aggregate a vast amount of music in personal collections. This brings with it the necessity to somehow organise this music. The established approach for this task is derived from physical music collections: browsing by artist and album is of course the best choice for searching familiar music for a specific track or release. Additionally, musical genres help to overview similarities in style among artists. However, this categorisation is quite ambiguous and difficult to carry out consistently. Often music is not selected by artist or album but by the occasion like doing sports, relaxing after work or a romantic candle-light dinner. In such cases it would be handy if there was a way to find songs which match the mood which is associated with the activity like "activating", "calming" or "romantic" [1, 2]. Of course, manual annotation of music would be a way to accomplish this. There also exist on-line databases with such information like Allmusic, (http://www.allmusic.com/). But the information which can be foundthere is very inaccurate because it is available on a per artist instead of a per track basis. This is where an automated way of classifying music into mood categories using machine learning would be helpful. Shedding light on current well-suited features, performances, and improving on this task is thus the concern of this article. Special emphasis is thereby laid on sticking to real world conditions by absence of any preselection of "friendly" cases either by considering only music with majority agreement of annotators and random partitioning of train and test instances. When it comes to automatic music mood prediction, the first task that arises is to find a suitable mood representation. Two different approaches are currently established: a discrete and a dimensional description. A discrete model relies on a list of adjectives each describing a state of mood like happy, sad or depressed. Hevner  was the first to come up with a collection of 8 word clusters consisting of 68 words. Later Farnsworth  regrouped them in 10 labelled groups which were used and expanded to 13 groups in recent work . Table 1 shows those groups. Also MIREX (Music Information Retrieval Evaluation eXchange) uses word clusters for its Audio Mood Classification (AMC) task as shown in Table 2. Ajdective groups (A–J) as presented by Farnsworth , K–M were extended by Li and Ogihara. MIREX 2008 Mood Categories (aggr. : aggressive, bittersw. : bittersweet, humor. : humerous, lit. : literate, rollick. : rollicking). However, the number and labelling of adjective groups suffers from being too ambiguous for a concise estimation of mood. Moreover, different adjective groups are correlated with each other as Russell showed . These findings implicate that a less redundant representation of mood can be found. Dimensional mood models are based on the assertion that different mood states are composed by linear combinations of a low number (i.e., two or three) of basic moods. The best known model is the circumplex model of affect presented by Russell in 1980  consisting of a "two-dimensional space of pleasure-displeasure and degree of arousal" which allows to identify emotional tags as points in the "mood space" as shown in Figure 1(a). Thayer  adopted this idea and divided the "mood space" in four quadrants as depicted in Figure 1(b). This model mainly has been used in recent research [9–11], probably because it leads to two binary classification problems with comparably low complexity. Dimensional mood model development: (a) shows a multidimensional scaling of emotion-related tags suggested by Russell . (b) is Thayer's model  with four mood clusters. Another task involved in mood recognition is the selection of features as a base for the used learning algorithm. This data either can be directly calculated from the raw audio data or metadata about the piece of music. The former further divide into so-called high- and low-level features. Low-level refers to the characteristics of the audio wave shape like amplitude and spectrum. From these characteristics more abstract—or high-level—properties describing concepts like rhythm or harmonics can be derived. Metadata involves all information that can be found about a music track. This begins at essential information like title or artist and ranges from musical genre to lyrics. Li and Ogihara  extracted a 30-element feature vector containing timbre, pitch, and rhythm features using Marsyas , a software framework for audio processing with specific emphasis on Music Information Retrieval applications. Liu  used music in a uniform format (16 kHz, 16 bits, mono channel) and divided into non-overlapping 32 ms long frames. Then timbre features based on global spectral and subband features were extracted. Global spectrum features were centroid, bandwidth, roll off, and spectral flux. Subband features were octave-based (7 subbands from 0 to 8 kHz) and consist of the minimum, maximum, and average amplitude value for each subband. The root mean square of an audio signal is used as an intensity feature. For extracting rhythm information only the audio information of the lowest subband was used. The amplitude envelope was extracted by use of a hamming window. Edge detection with a Canny estimator delivered a so-called rhythm curve in which peaks were detected as bass instrumental onsets. The average strength of peaks then was used as an estimate for the strength of the rhythm. Auto-correlation delivered information about the regularity of the rhythm and the common divisor of the correlation peaks was interpreted as the average tempo. Lu et al. continued the work of Liu using the same preprocessing of audio files. Also the timbre and intensity features were identical. To calculate the rhythm curve this time, all subbands were taken into account. The amplitude envelope was extracted for each subband audio signal using a half-Hanning window. A Canny edge detector was used on it to calculate an onset curve. All subband onset curves were then summed up to deliver the rhythm curve from which strength, regularity, and tempo were calculated as explained above. Trohidis et al. also used timbre and rhythm features, which were extracted as described in the following: two estimates for tempo (bpm) (beats per minute) were calculated by identifying peaks in an autocorrelated beat histogram. Additional rhythmic information from the beat histogram was gathered by calculating amplitude ratios and summing of histogram ranges. Timbre features were extracted from the Mel Frequency Cepstral Coefficients (MFCC)  and the Short-Term Fourier Transform (FFT), which were both calculated per sound frame of 32 ms duration. From the MFCCs the first 13 coefficients were taken and from the FFT the spectral characteristics centroid, roll off, and flux were derived. Additionally, mean and standard deviation of these features were calculated over all frames. Peeters  used the following three feature groups in his submission for the MIREX 2008, (http://www.music-ir.org/mirex/2008/) audio mood classification task: MFCC, SFM/SCM, and Chroma/PCP The MFCC features were 13 coefficients including the DC component. SFM/SCM are the so-called Spectral Flatness and Spectral Crest Measures. They capture information about whether the spectrum energy is concentrated in peaks or if it is flat. Peaks are characteristic for sinusoidal signals while a flat spectrum indicates noise. Chroma/PCP or Pitch Class Profile represents the distribution of signal energy among the pitch classes (refer to Section 2.3). Like with mood taxonomies there is still no agreed consensus on the learning algorithms to use for mood prediction. Obviously, the choice highly depends on the selected mood model. Recent research, which deals with a four-class dimensional mood model [9, 10], uses Gaussian Mixture Models (GMM) as a base for a hierarchical classification system (HCS): at first a binary decision on arousal is made using only rhythm and timbre features. The following valence classification is then derived from the remaining features. This approach yields an average classification accuracy of 86.3%, based on a database of 250 classical music excerpts. Additionally, the mood tracking method presented there is capable of detecting mood boundaries with a high precision of 85.1% and a recall of 84.1% on a base of 63 boundaries in 9 pieces of classical music. Recently the second challenge in audio mood classification was held as a part of the MIREX 2008. The purpose of this contest is to monitor the current state of research: this year's winner in the mood classification task, Peeters , achieved an overall accuracy of 63.7% on the five mood classes shown in Table 2 before the second placed participant with 55.0% accuracy. Having presented the current state of research in automatic mood classification the main goals for this article are presented. The first aim of this work is to build up a music database of annotated music with sufficient size. The selected music should cover today's popular music genres. So this work puts emphasis on popular rather than classical music. In contrast to most existing work no preselection of songs is performed, which is presently also considered a major challenge in the related field of emotion recognition in human speech [16, 17]. It is also attempted to deal with ambiguous songs. For that purpose, a mood model capable of representing ambiguous mood is searched. Most existing approaches exclusively use low-level features. So in this work middle-level features that partly base on preclassification are additionally used and tested for suitability to improve the classification. Another task is the identification of relevant features by means of feature relevance analysis. This step is important because it can improve classification accuracy while reducing the number of attributes at the same time. Also all feature extraction is based on the whole song length rather than to select excerpts of several seconds and operate only on them. The final and main goal of this article is to predict a song's mood under real world conditions, that is, by using only meta information available on-line, no preselection of music, and compressed music, as reliably as possible. Additionally, factors limiting the classification success shall be identified and addressed. Section 2 deals with the features that are used as the informational base for machine learning. Section 3 contains a description of the music database and all experiments that are conducted. Finally, Section 4 presents the experiments' results, and Section 5 concludes the most important findings. Like in every machine learning problem it is crucial for the success of mood detection to select suitable features. Those are features which convey sufficient information on the music in order to enable the machine learning algorithm to find correlations between feature and class values. Those features either can be extracted directly from the audio data or retrieved from public databases. Both types of features are used in this work and their use for estimating musical mood is investigated. Concerning musical features, both low-level features like spectrum and middle-level features like chords are employed. In the field of emotion recognition from speech it is commonly agreed that textual information may help improve over mere acoustic analysis [18, 19]. For 1937 of 2648 songs in the database (cf. Section 3.1) lyrics can automatically be collected from two on-line databases: in a first run lyricsDB, (http://lyrics.mirkforce.net/) is applied, which delivers lyrics for 1 779 songs, then LyricWiki, (http://www.lyricwiki.org/) is searched for all remaining songs, which delivers lyrics for 158 additional songs. LyricsDB The only post-processing needed is to remove obvious "stubs", that is, lyrics containing only some words when the real text is much longer. However, this procedure does not ensure that the remainder of the lyrics is complete or correct at all. It has to be remarked that not only word by word transcripts of a song are collected, but that there are inconsistent conventions used among the databases. So some lyrics contain passages like "Chorus x2" or "(Repeat)", which makes the chorus appear less often in the raw text than it can be heard in a song. To extract information from the raw text that is usable for machine learning, two different approaches are used, as follows. The first approach is using ConceptNet [20, 21], a text-processing toolkit that makes use of a large semantic database automatically generated from sentences in the Open Mind Common Sense Project, (http://openmind.media.mit.edu/). The software is capable of estimating the most likely emotional affect in a raw text input. This has already been shown quite effective for valence prediction in movie reviews . Listing 1 displays the output for an example song. The underlying algorithm profits from a subset of concepts that are manually classified into one of six emotional categories (happy, sad, angry, fearful, disgusted, and surprised). Now the emotional affect of unclassified concepts that are extracted from the song's lyrics can be calculated by finding and weighting paths which lead to those classified concepts. The program output is directly used as attributes. Six nominal attributes with the emotional category names as possible values indicate which mood is the most, second least dominant in the lyrics. Six additional numeric attributes contain the corresponding probabilities. Note that other alternatives exist, as the word lists found in , which directly assigns arousal and valence values to words, yet consist of more limited vocabulary. The second approach uses text processing methods introduced in  and shown efficient for sentiment detection in [19, 21]. The raw text is first split into words while removing all punctuation. In order to recognise different flexions of the same word (e.g., loved, loving, loves should be counted as love), the conjugated word has to be reduced to its word stem. This is done using the Porter stemming algorithm . It is based on the following idea: each (English) word can be represented in the form , where ( ) denotes a sequence of one or more consecutive consonants (vowels) and is called the measure of the word ( here means an -fold repetition of the string ). Then, in five separated steps, replacement rules are applied to the word. The first step deals with the removal of plural and participle endings. The steps 2 to 5 then replace common word endings like ATION ATE or IVENESS IVE. Many of those rules contain conditions under which they may be applied. For example, the rule "( ) TIONAL TION" only is applied when the remaining stem has a measure greater than zero. This leaves the word "rational" unmodified while "occupational" is replaced. If more than one rule matches in a step, the rule with the biggest matching suffix is applied. A numerical attribute is generated for each word stem that is not in the list of stopwords and occurs at least ten times in one class. The value can be zero if the word stem cannot be found in a song's lyrics. Otherwise, if the word occurs, the number of occurrences is ignored, and the attribute value is set to one, only normalised to the total length of the song's lyrics. This is done to estimate the different prevalence of one word in a song dependent on the total amount of text. The mood associated with this numerical representation of words contained in the lyrics is finally learned by the classifier as for any acoustic feature. Note that the word order is neglected in this modelling. One could also consider compounds of words by -grams, that is, consecutive words. Yet, this usually demands for considerably higher amounts of training material as the feature space is blown up exponentially. In our experiments this did not lead to improvements on the tasks presented in the ongoing. Additional information about the music is sparse in this work because of the large size of the music collection used (refer to Section 3.1): besides the year of release only the artist and title information is available for each song. While the date is directly used as a numeric attribute, the artist and title fields are processed in a similar way as the lyrics (cf. Section 2.1.2 for a more detailed explanation of the methods): only the binary information about the occurrence of a word stem is obtained. The word stems are generated by string to word vector conversion applied to the artist and title attributes. Standard word delimiters are used to split multiple text strings to words and the Porter stemming algorithm  reduces words to common stems in order to map different forms of one word to their common stem. To limit the number of attributes that are left after conversion, a minimum word frequency is set, which determines how often a word stem must occur within one class. While the artist word list looks very specific to the collection of artists in the database, the title word list seems to have more general relevance with words like "love", "feel", or "sweet". In total, the metadata attributes consist of one numeric date attribute and 152 binary numeric word occurrence attributes. A musical chord is defined as a set of three (sometimes two) or more simultaneously played notes. A note is characterised by its name—which is also referred to as pitch class—and the octave it is played in. An octave is a so-called interval between two notes whose corresponding frequencies are at a ratio of 2 : 1. The octave is a special interval as two notes played in it sound nearly equal. This is why such notes share the same name in music notation. The octave interval is divided into twelve equally sized intervals called semitones. In western music these are named as shown in Figure 2 which visualises these facts. In order to classify a chord, only the pitch classes (i.e., the note names without octave number) of the notes involved are important. There are several different types of chords depending on the size of intervals between the notes. Each chord type has a distinct sound which makes it possible to associate it with a set of moods as depicted in Table 3. Chord types and their associated emotions . The pitch helix as presented in . 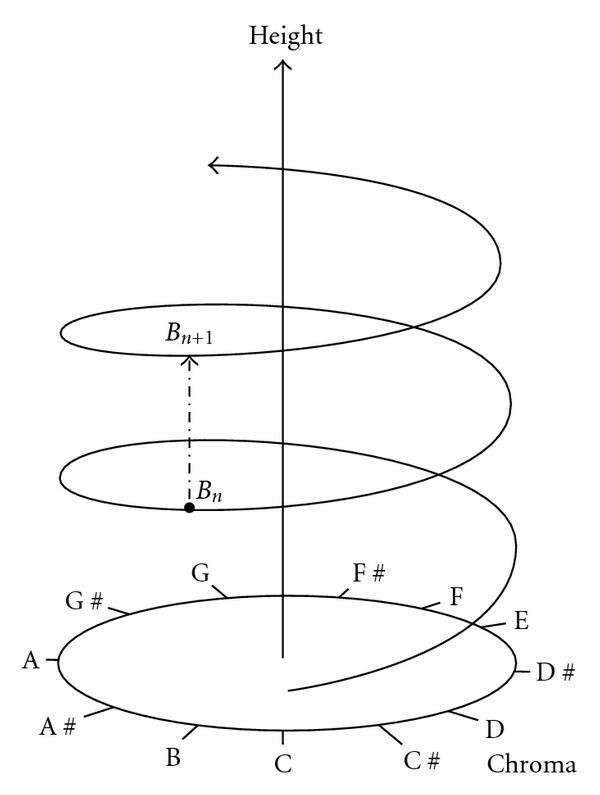 The height axis is associated with a note's frequency and the rotation corresponds to the pitch class of a note. Here, is one octave below . For chord extraction from the raw audio data a fully automatic algorithm as presented by Harte and Sandler  is used. Its basic idea is to map signal energy in frequency subbands to their corresponding pitch class which leads to a chromagram  or pitch class profile (PCP). Each possible chord type corresponds to specific pattern of tones. By comparing the chromagram with predefined chord templates, an estimate of the chord type can be made. However, also data-driven methods can be employed . Table 4 shows the chord types that are recognised. To determine the tuning of a song for a correct estimation of semitone boundaries, a 36-bin chromagram is calculated first. After tuning, an exact 12-bin chromagram can be generated which represents the 12 different semitones. The resulting estimate gives the chord type (e.g., major, minor, diminished) and the chord base tone (e.g., C, F, G ) (cf. for further details). Chord types which are recognised and extracted. Timing information are withdrawn and only the sequence of recognised chords are used subsequently. For each chord name and chord type the number of occurrences is divided by the total number of chords in a song. This yields 22 numeric attributes, 21 describing the proportion of chords per chord name or type, and the last one is the number of recognised chords. Widespread methods for rhythm detection make use of a cepstral analysis or autocorrelation in order to perform tempo detection on audio data. However, cepstral analysis has not proven satisfactory on music without strong rhythms and suffers from slow performance. Both methods have the disadvantages of not being applicable to continuous data and not contributing information to beat tracking. The rhythm features used in this article rely on a method presented in [30, 31] which itself is based on former work by Scheirer . It uses a bank of comb filters with different resonant frequency covering a range from 60 to 180 bpm. The output of each filter corresponds to the signal energy belonging to a certain tempo. This approach has several advantages: it delivers a robust tempo estimate and performs well for a wide range of music. Additionally, its output can be used for beat tracking which strengthens the results by being able to make easy plausibility checks on the results. Further processing of the filter output determines the base meter of a song, that is, how many beats are in each measure and what note value one beat has. The implementation used can recognise whether a song has duple (2/4, 4/4) or triple (3/4, 6/8) meter. The implementation executes the tempo calculation in two steps: first, the so called "tatum" tempo is searched. The tatum tempo is the fastest perceived tempo present in a song. For its calculation 57 comb filters are applied to the (preprocessed) audio signal. Their outputs are combined in the unnormalised tatum vector . The meter vector consists of normalised entries of score values. Each score value determines how well the tempo resonates with the song. The Tatum vector is the normalised vector of filter bank outputs. Tatum candidates , are the tempi corresponding to the two most dominant peaks . The candidate with the higher confidence is called the tatum tempo . The main tempo is calculated from the meter vector . Basically, the tempo which resonates best with the song is chosen. The tracker tempo is the same as main tempo, but refined by beat tracking. Ideally, and should be identical or vary only slightly due to rhythm inaccuracies. The base meter and the final meter are the estimates whether the songs has duple or triple meter. Both can have one of the possible values 3 (for triple) or 4 (for duple). The tatum maximum is the maximum value of . The tatum mean is the mean value of . The tatum ratio is calculated by dividing the highest value of by the lowest. The tatum slope the first value of divided by the last value. The tatum peak distance is the mean of the maximum and minimum value of normalised by the global mean. This finally yields 87 numeric attributes, mainly consisting of the tatum and meter vector elements. To represent the global characteristics of the spectrum, the following values are calculated and used as features. The centre of gravity . The standard deviation which is a measure for how much the frequencies in a spectrum can deviate from the centre of gravity. It is equal to . The skewness which is a measure for how much the shape of the spectrum below the centre of gravity is different from the shape above the mean frequency. It is calculated as . The kurtosis which is a measure for how much the shape of the spectrum around the centre of gravity is different from a Gaussian shape. It is equal to . Band energies and energy densities for the following seven octave based frequency intervals: 0?Hz–200?Hz, 200?Hz–400?Hz, 400?Hz–800?Hz, 800?Hz–1.6?kHz, 1.6?kHz–3.2?kHz, 3.2?kHz–6.4?kHz, and 6.4?kHz–12.8?kHz. For building up a ground truth music database the compilation "Now That's What I Call Music!" (U. K. series, volumes 1–69, double CDs, each) is selected. It contains 2648 titles— roughly a week of continuous total play time—and covers the time span from 1983 until now. Likewise it represents very well most music styles which are popular today; that ranges from Pop and Rock music over Rap, R&B to electronic dance music as Techno or House. The stereo sound files are MPEG-1 Audio Layer 3 (MP3) encoded using a sampling rate of 44.1 kHz and a variable bit rate of at least 128 kBit/s as found in many typical use-cases of an automatic mood classification system. A more refined discretisation of the two mood dimensions is needed. First a pseudo-continuous annotation was considered, that is, , but after the annotation of 250 songs that approach showed to be too complex in order to achieve a coherent rating throughout the whole database. So the final model uses five discrete values per dimension. With all songs receive a rating as visualised in Figure 3. Dimensional mood model with five discrete values for arousal and valence. Songs were annotated as a whole: many implementations have used excerpts of songs to reduce computational effort and to investigate only on characteristic song parts. This either requires an algorithm for automatically finding the relevant parts as presented, for example, in [34–36] or , or needs selection by hand, which would be a clear simplification of the problem. Instead of performing any selection, the songs are used in full length in this article to stick to real world conditions as closely as possible. Respecting that mood perception is generally judged as highly subjective , we decided for four labellers. As stated, mood may well change within a song, as change of more and less lively passages or change from sad to a positive resolution. Annotation in such detail is particularly time-intensive, as it not only requires multiple labelling, but additional segmentation, at least on the beat-level. We thus decided in favour of a large database where changes in mood during a song are tried to be "averaged" in annotation, that is, assignment of the connotative mood one would have at first on mind related to a song that one is well familiar with. In fact, this can be very practical and sufficient in many application scenarios, as for automatically suggestion that fits a listener's mood. A different question though is, whether a learning model would benefit from a "cleaner" representation. Yet, we are assuming the addressed music type—mainstream popular and by that usually commercially oriented—music to be less affected by such variation as, for example, found in longer arrangements of classical music. In fact, a similar strategy is followed in the field of human emotion recognition: it has been shown that often up to less than half of the duration of a spoken utterance portrays the perceived emotion when annotated on isolated word level . Yet, emotion recognition from speech by and large ignores this fact by using turn-level labels as predominant paradigm rather than word-level based such . Details on the chosen raters (three male, one female, aged between 23 and 34 years; (average: 29 years) and their professional and private relation to music are provided in Table 5. Raters A–C stated that they listen to music several hours per day and have no distinct preference of any musical style, while rater D stated to listen to music every second day on average and prefers Pop music over styles as Hard-Rock or Rap. Overview on the raters (A–D) by age, gender, ethnicity, professional relation to music, instruments played, and ballroom dance abilities. The last column indicates the cross-correlation (CC) between valence (V) and arousal (A) for each rater's annotations. As can be seen, they were picked to form a well-balanced set spanning from rather "naive" assessors without instrument knowledge and professional relation to "expert" assessors including a club disc jockey (D. J.). The latter can thus be expected to have a good relationship to music mood, and its perception by the audiences. Further, young raters prove a good choice, as they were very well familiar with all the songs of the chosen database. They were asked to make a forced decision according to the two dimensions in the mood plane assigning values in for arousal and valence, respectively, and as described. They were further instructed to annotate according to the perceived mood, that is, the "represented" mood, not to the induced, that is, "felt" one, which could have resulted in too high labelling ambiguity: while one may know the represented mood, it is not mandatory that the intended or equal mood is felt by the raters. Indeed, depending on perceived arousal and valence, different behavioural, physiological, and psychological mechanisms are involved . Listening was chosen via external sound proof headphones in isolated and silent laboratory environment. The songs were presented in MPEG-1 Audio Layer 3 compression in stereo variable bit rate coding and 128 kBit/s minimum as for the general processing afterwards. Labelling was carried out individually and independent of the other raters within a period of maximum 20 consecutive working days. A continuous session thereby took a maximum time of two hours. Each song was fully listened to with a maximum of three times forward skipping by 30 seconds, followed by a short break, though the raters knew most songs in the set very well in advance due to their popularity. Playback of songs was allowed, and the judgments could be reviewed—however, without knowledge of the other raters' results. For the annotation a plugin (available at http://www.openaudio.eu/) to the open source audio player Foobar: (http://www.foobar2000.org/) was provided that displays the valence arousal plane colour coded as depicted in Figure 3 for clicking on the appropriate class. The named skip of 30 seconds forward was obtained via hot key. In order to establish a ground truth that considers every rater's labelling without exclusion of instances, or songs, respectively, that do not possess a majority agreement in label, a new strategy has to be found: in the literature such instances are usually discarded, which however does not reflect a real world usage where a judgment is needed on any musical piece of a database as its prototypcality is not known in advance or, in rare works subsumed as novel "garbage" class . The latter was found unsuited in our case, as the perception among the raters differs too strongly, and a learnt model is potentially corrupted too strongly by such a garbage class that may easily "consume" the majority of instances due to its lack of sharp definition. We thus consider two strategies that both benefit from the fact that our "classes" are ordinal, that is, they are based on a discretised continuum: mean of each rater's label or median, which is known to better take care of outliers. To match from mean or median back to classes, a binning is needed, unless we want to introduce novel classes "in between" (consider the example of two raters judging "0" and two "1": by that we obtain a new class "0.5"). We choose a simple round operation to this aim of preserving the original five "classes". To evaluate which of these two types of ground truth calculation is to be preferred, Table 6 shows mean kappa values with none (Cohen's), linear, and quadratic weighting over all raters and per dimension. 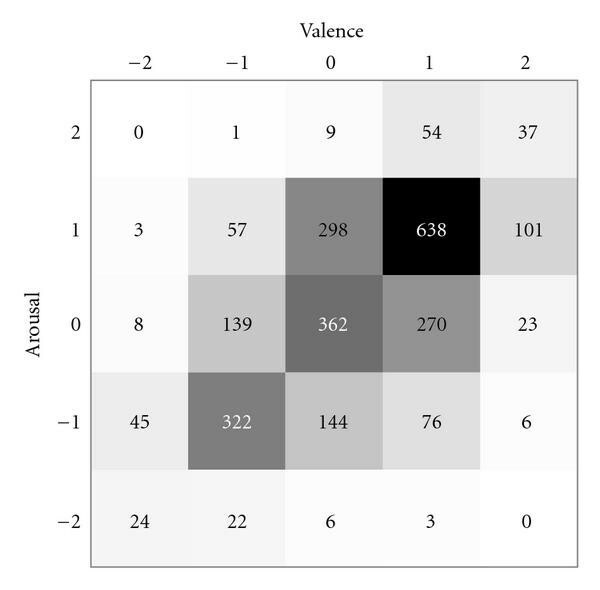 In addition to the five classes (in the ongoing abbreviated as V5 for valence and A5 for arousal), it considers a clustering of the positive and negative values per dimensions, which resembles a division by two prior to the rounding operation (V3 and A3, resp.). Mean kappa values over the raters (A–D) for four different calculations of ground truth (GT) obtained either by employing rounded mean or median of the labels per song. Reduction of classes by clustering of the negative or positive labels, that is, division by two. An increasing kappa coefficient by going from no weighting to linear to quadratic thereby indicates that confusions between a rater and the established ground truth occur rather between neighbouring classes, that is, a very negative value is less often confused with a very positive than with a neutral one. Generally, kappa values larger 0.4 are considered as good agreement, while such larger 0.7 are considered as very good agreement . Obviously, choosing the median is the better choice—may it be for valence or arousal, five or three classes. Further, three classes show better agreement unless when considering quadratic weighting. The latter is however obvious, as less confusions with far spread classes can occur for three classes. 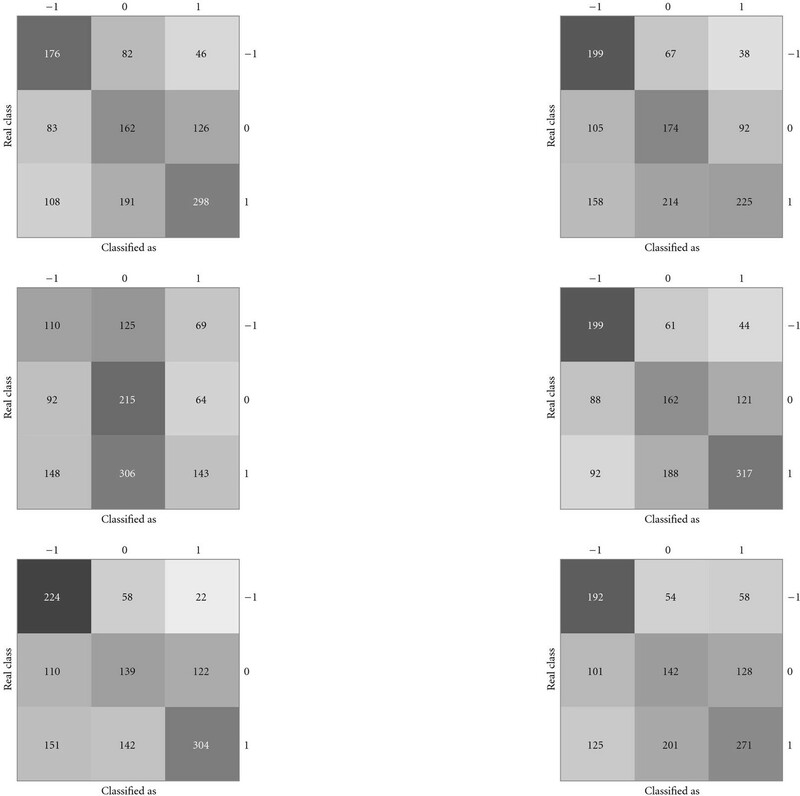 The choice of ground truth for the rest of this article thus is either (rounded) median after clustering to three classes, or each rater's individual annotation. In Table 7 the differences among the raters with respect to accordance to this chosen ground truth strategy—three degrees per dimension and rounded median—are revealed. In particular rater B notably disagrees with the valence ground truth established by all raters. Other than that, generally good agreement is observed. Overview on the raters (A–D) by their kappa values for agreement with the median-based inter-labeller agreement as ground truth for three classes per dimension. The preference of three over five classes is further mostly stemming from the lack of sufficient instances for the "extreme" classes. This becomes obvious looking at the resulting distribution of instances in the valence-arousal plane by the rounded median ground truth for the original five classes per dimension as provided in Figure 5. This distribution shows a further interesting effect: though practically no correlation between valence and arousal was measured for the raters B and C, and not too strong such for raters A and D (cf. right most coloumn in Table 5), the agreement of raters seems to be found mostly in favour of such a correlation: the diagonal reaching from low valence and arousal to high valence and arousal is considerably more present in terms of frequency of musical pieces. This may either stem from the nature of the chosen compilation of the CDs, which however well cover the typical chart and aired music of their time, or that generally music with lower activation is rather found connotative with negative valence and vice versa (consider hereon the examples of ballads or "happy" disco or dance music as examples). class distribution of the music database (2648 total instances) after annotation based on rounded median of all raters. 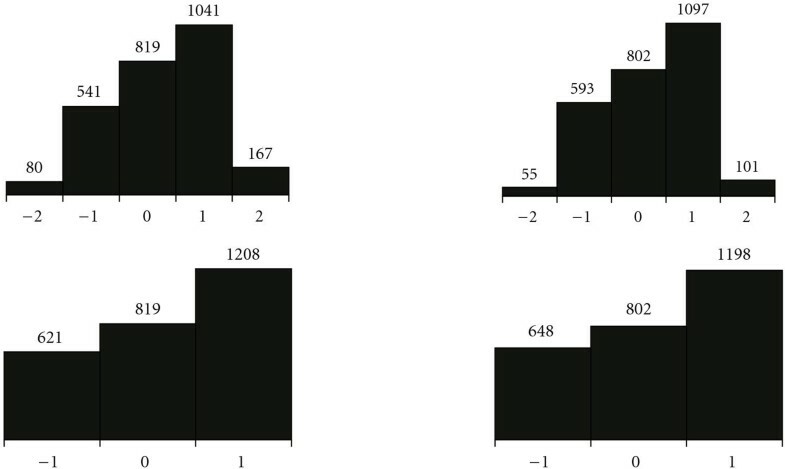 The distributions among the five and three classes (as mentioned by clustering of negative and positive values, each) individually per dimension shown in Figure 6 further illustrates the reason to be found in choosing the three over the five classes in the ongoing. First all 2648 songs are used in a dataset named AllInst. For evaluation of "true" learning success, training, development, and test partitions are constructed: we decided for a transparent definition that allows easy reproducibility and is not optimized in any respect: training and development are obtained by selecting all songs from odd years, whereby development is assigned by choosing every second odd year. By that, test is defined using every even year. The distributions of instances per partition are displayed in Figure 7 following the three degrees per dimension. Once development was used for optimization of classifiers or feature selection, the training and development sets are united for training. Note that this partitioning resembles roughly 50%/50% of overall training/test. Performances could probably be increased by choosing a smaller test partition and thus increasing the training material. Yet, we felt that more than 1000 test instances favour statistically more meaningfull findings. To reveal the impact of prototypicality, that is, limiting to instances or musical pieces with clear agreement by a majority of raters, we additionally consider the sets Min2/4 for the case of agreement of two out of four raters, while the other two have to disagree among each other, resembling unity among two and draw between the others, and the set Min3/4, where three out of four raters have to agree. Note that the minimum agreement is based on the original five degrees per dimension and that we consider this subset only for the testing instances, as we want to keep training conditions fixed for better transparency of effects of prototypization. The according distributions are shown in Figure 8. In addition to the data partitions, the performance is examined in dependence on the subset of attributes used. Refer to Table 8 for an overview of these subsets. They are directly derived from the partitioning in the features section of this work. To better estimate the influence of lyrics on the classification, a special subset called NoLyr is introduced, which contains all features except those derived from lyrics. Note in this respect that for 25% (675) songs no lyrics are available within the two used on-line databases which was intentionally left as is to again further realism. Feature subsets for attribute dependent analysis of classifier success. Training on the unmodified training set is likely to deliver a highly biased classifier due to the unbalanced class distribution in all training datasets. To overcome this problem, three different strategies are usually employed [16, 21, 43]: the first is downsampling, in which instances from the overrepresented classes are randomly removed until each class contains the same number of instances. This procedure usually withdraws a lot of instances and with them valuable information, especially in highly unbalanced situations: it always outputs a training dataset size equal to the number of classes multiplied with number of instances in the class with least instances. In highly unbalanced experiments, this procedure thus leads to a pathological small training set. The second method used is upsampling, in which instances from the classes with proportionally low numbers of instances are duplicated to reach a more balanced class distribution. This way no instance is removed from the training set and all information can contribute to the trained classifier. This is why random upsampling to forced equal class distribution is chosen in this article throughout. To not falsify the classification results, it is important that only the training instances are upsampled. For upsampling a target size of 200% (number of instances) of the upsampled training dataset compared to the original dataset is employed. Likewise replacement of instances is allowed so that equal class distribution is also achievable in highly unbalanced experiments. At the same time it is ensured that each original instance is preserved in the training material. Apart from the fact that a mixed up-, and down-sampling strategy can be followed as compromise between the above, a third variant is assignment of different weighting of instances for the computation of the classifier objective function. In practice, this is often actually often solved by classifier internal upsampling, and may lead to less stable results, while not providing any advantage in our respect, as obtainable performances are not higher, which is why this variant was not further pursued. However, this may be well of interest in an on-line system which needs to be adapted, for example, when a user labels a new song to adapt his audio-playing device. Finally, the classifier success highly depends on a reliable feature selection. As there are 691 attributes in total, it is crucial to identify redundant or useless attributes and remove them before applying the classifier on the training data. We approach this topic in two ways: first we are interested to find the most relevant attributes. For that we decide for a vertical view and divide by group measuring the "value" by a classification task. Second, we want to see obtainable boost deriving from a better representation of the problem in a more compact feature space that is freed of irrelevant correlated information. This is best obtained by employing the target classifier in a "wrapper" manner and its accuracy as evaluation measure. Given the size of the data set and the feature space, a search function is mandatory, as exhaustive search becomes computationally prohibitive. A simple, yet highly efficient method to this aim is "conservative hill climbing", that is, deciding for the best feature at the time starting from none and adding the "next best", each. As this obviously is prone to nesting effects, one usually adds a back stepping option whether "another previous candidate" would have better suited. This is known as floating, and with the described forward addition as Sequential Forward Floating Search. As a result, one obtains a horizontal view, which is usually hard to interpret: features in the optimal set, which is found by best performance on the development set, are usually a mixture of all groups. Yet, it is not clear whether these are the best due to the suboptimal nature inherent in any search function and the fact that it de-correlates the space rather than ranks. By that the value of a feature is unclear, as is whether a picked feature does not have a counter-part of similar characteristics that was not picked, as only one of a sort is needed. The classifier used in the first order is Support Vector Machines (SVM) trained with Sequential Minimal Optimisation (SMO) , the complexity value set to and a linear kernel function. Multiclass discrimination is reached by a pairwise 1-versus-1 strategy. The best choice of is determined by calculating the classifier accuracy of two classification tasks (V3 and A3) for on the development set. Increasing the exponent value of the Kernel function was considered, but showed to have no positive effect on the classifier accuracy. In addition, further classifiers will be used in one experiment for exploration on classifier choice. All results are provided by accuracy, that is, the number of correctly assigned instances divided by the total number of instances. In addition, we provide the mean precision and recall, which are obtained without weighting by number of instances per class (note that weighting the recall prior to mean calculation resembles the accuracy). By that the imbalance of songs among classes is better reflected, and one has a good feeling of chance level: for mean recall this simply depends on the number of classes, which in our case are three throughout, as we consider valence and arousal separately. As first experiment we want to measure the relevance of each feature group as introduced in Section 3.3 To this aim we consider the ground truth by rounded median and all instances and classify per group in isolation. 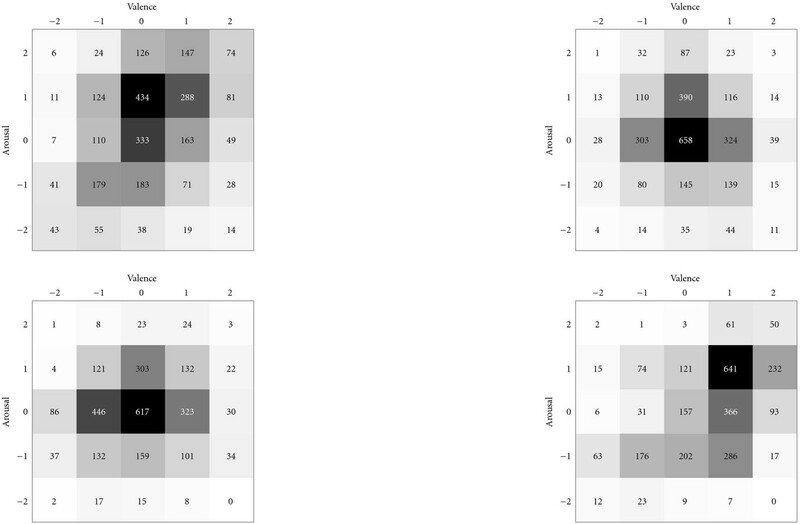 In Table 9, these results are summarised, whereas Figures 9 and 10 depict according confusions matrices per type. 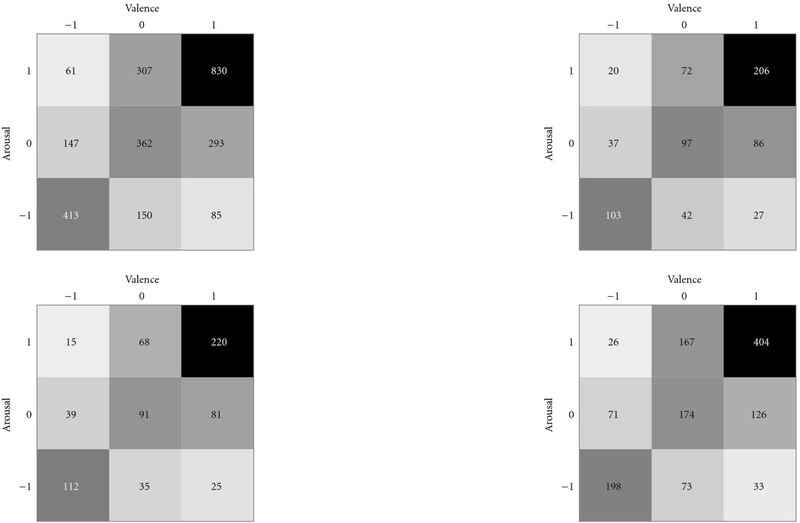 Lassification accuracies (acc), mean precision (pre), and mean recall (rec) for classification on AllInst test data against different attribute subsets for the V3 and A3 tasks, SVM. The recognition rates clearly illustrate the challenge of the task: some groups as the concepts or even lyrics are found hardly above chance level when used on their own. Surprisingly low differences are further observed between performances per type among valence and arousal. The fact that all features in union are inferior to the set without lyrics clearly shows the too high dimensionality of the feature space. Most notably, the rhythm features which in this form are introduced in this work for the task of mood detection, are almost on par to the complete set without lyrics and by that also significantly outperform spectral features. The latter are also outperformed by the chord-based features, which overall emphasizes the high suitability of the middle-level rhythmic and chord features. The confusion matrices for the NoLyr and Rhy sets show fewer confusions among the classes further spread apart which adds to the practicability of the results: negative or positive is more likely confused with neutral than the opposite. We next investigate differences between the different raters in terms of obtainable classification performance. The according results of the classification tasks, which consider each rater individually, are presented in Table 10 for the NoLyr set, which was found superior in the previous evaluation and will thus be used in the ongoing. The tasks are again V3 and A3 on the set AllInst. Overview on the raters (A–D) by accuracy (acc), precision (pre), and recall (rec) for the V3 and A3 tasks based on each rater's individual labels. Feature set NoLyr, set AllInst, SVM. Significant differences are found among the raters. Considering valence, annotation by the professional D. J. leads to the highest accuracy values. In case of arousal the differences are even more distinct which may be an indication that arousal annotation differs even more strongly. To obtain a better impression in comparison with the predominant studies that limit to instances that are agreed upon by the majority of raters in terms of portrayed mood, Table 11 investigates the limitation of the test instances to those agreed upon by a minimum of two or three out of four raters as described: the training set is kept constant based on all instances, while the test set is accordingly reduced. As to be expected, accuracy is higher for the instances with higher agreement. These differences are even stronger for arousal. Prototypicality effect: classification accuracies (acc), mean precision (pre), and mean recall (rec) for training with the training and development instances of AllInst, and testing on those of AllInst, Min2/4, and Min3/4. NoLyr feature set, V3 and A3 tasks, selection by SFFS (of the 286 original features 131 are found as optimal for the A3, and 132 for the V3 task). In this table we also provide results obtained by feature selection—this time aiming at increased accuracy rather than interpretation. By that a gain is reached in accuracy for all constellations but prototypical arousal. Overall, roughly 8% are gained absolute by going from all to more prototypical instances. So far we sticked to SVM as classifier of choice. Naturally, different performances may be obtained with other such. Table 12 depicts results for a selection that aims at a good coverage of representatives from different heritage while limiting their choice: Random Forests are chosen as good example of boosted decision trees which at the same time subsample the feature space and thus inject random in the bootstrapping and feature optimization process. In addition they inherit feature selection by their alignment of decision nodes based on Gain Ratio in combination with pruning of lower nodes. A structure learned Bayesian Network was further chosen as representative for statistical learners. Finally, at the lower end, a simple distance-based k Nearest Neighbour classifier is chosen. Comparison of classifiers: classification accuracies (acc), mean precision (pre), and mean recall (rec) for classification on AllInst test data with the NoLyr feature set for the V3 and A3 tasks. Considered alternatives to SVM are Random Forests (RF, with 250 trees found optimal and minor differences in the range between 100–250), a K2 hill climbing structure-learnt Bayesian Network (BN), and k Nearest Neighbours with Euclidean distance (kNN, with k being 5 found optimal). Feature set NoLyr. 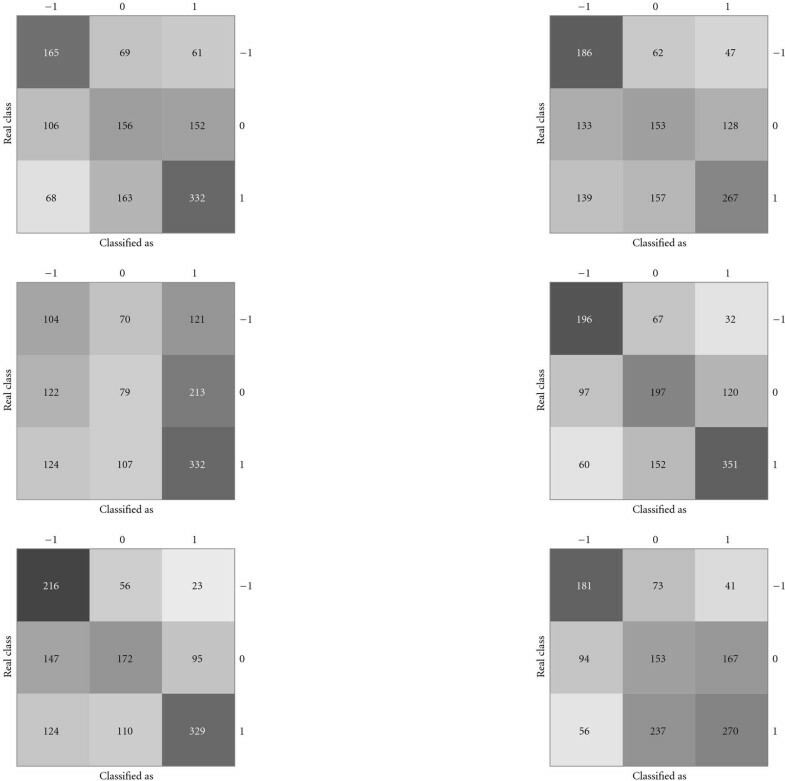 Parameters have been optimized for the classifiers on the development set, each, and significant differences are found between SVM and Random Forests on the "stronger end" and their counterparts. In this comparison Random Forests are actually observed superior to SVM. This effect however was not found to be persistent by repetition of the previously shown results. They were thus not preferred over SVM, as less transparency exists in terms of bootstrapping and feature space subsampling. Deriving from the ordinal nature of the classes, one can additionally consider regression approaches (cf. [21, 43]). Yet, this suffers from the uneven and distinct distribution as considerably more than four labellers would be needed to obtain a genuine continuum from the mean values of valence and arousal. In this paper, a system for automatic music mood prediction based on musical features and lyrics is presented and tested against a large database of popular music. A mood model with three to five class values for the two dimensions valence and arousal is applied in order to generate a ground truth for scalable mood prediction with respect to the level of mood resolution. Due to the mood model design, not only clearly neutral songs receive a class value of zero, but also those where some parts are positive and others negative in respect to the mood dimensions. 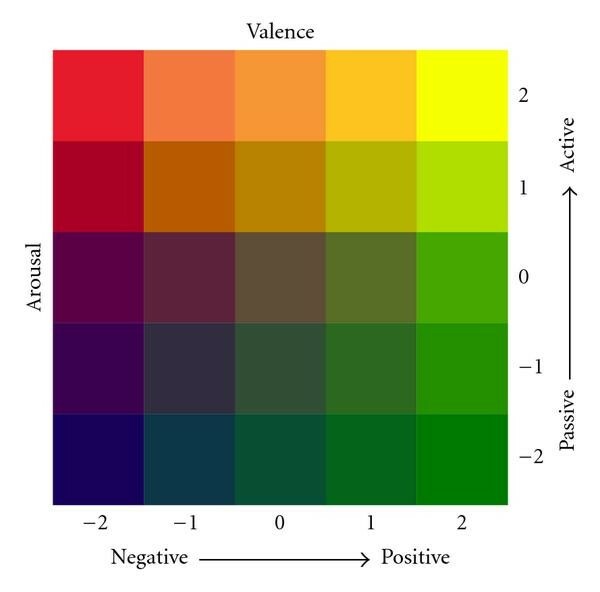 Less abstractly spoken, a song with both happy and sad sections can "average" to neutral valence which makes the song receive a valence value of 0, which is obviously not the same as a song with no remarkable positive or negative valence. That is why a separate class for ambiguous songs particularly in this respect (as opposed to ambiguous due to mismatch in labelling) probably could improve classification results. Another approach to better handle ambiguous songs would be to adapt a mood tracking system as presented by Lu et al. for classical music. This way music is split into small chunks of constant mood, which are presumably easier to classify correctly. In this case, an interesting problem will be to find a clear representation for the complex prediction made by such a system. Moreover, to establish a ground truth database for such a system implies—as stated—considerable efforts. However, automatic music structure analysis may be considered as tool (e.g., [34, 37]). The following findings are made concerning the performance of feature groups for different classification tasks: rhythmic, chord-based, and spectral features are primarily suitable to determine a song's valence and arousal. Especially the rhythm and chord features presented in this work seem to have high potential. Lyrics surprisingly do not contribute much to the classification results in these investigations. Applying the same methods to the artist and title tag is not considered of higher benefit, either. This may be overcome by integration of further meta information as usage information . More research is needed to compare different ways of generating meaningful features from both metadata and lyrics. ConceptNet's mood guess on the lyrics content seems promising but it does not contribute to the classification success when applied like presented here. Dealing with "every music that comes in", we had proposed usage of the (rounded) median to provide a label even in the case of complete rater disagreement. This better fits the paradigm of a dimensional approach, as introduction of a garbage class would disrupt the ordinal structure. Alternatively, we had reduced the test instances by those that lack such agreement. As to be expected, more prototypical instances lead to higher performances. By that the overall accuracies and mean recall rate were found around 60% in the case of processing all instances, and around 70% in the case of prototypical representatives for the two three-class tasks of valence and arousal determination. For these constellations confusions were observed with the neighbouring classes, which raises practicability. Yet, clearly future efforts will be needed before systems can fully automatically judge on musical mood no matter what music is provided. In addition, high variances between the labellings by four raters were observed that also led to significantly differing performances when the system was trained per rater. This shows that mood perception is indeed rather subjective, and that it will be challenging at different levels to follow every user's perception once a user would be willing to train or personalize such a system. Such future work may consider more elaborate low-level feature extraction, for example, by use of wavelets . Also, estimation of middle-level features as chords can be improved, for example, by enhancement through musical source separation . In addition, alternative fusion strategies of features may be followed, for example, by classifying and optimizing for each feature group individually and fusing in a late manner opposed to the herein chosen strategy of accumulating all features in one classifier. While we had shown the fusion of acoustic and textual information in this work, future research may further consider integration of video information such as low-level colour histograms or even high-level interpretation for the classification of mood in music videos as shown beneficial in the field of emotion recognition . The general distinction between high and low valence and arousal certainly satisfies many use-cases as mood matching, yet further dimensions may also be evaluated, as the "dominance" often met in emotion modelling or self-learnt spaces as introduced in . Finally, clearly added rater tracks will be of interest and effects on ground truth stability. Considering the demonstrated performance in combination with the proposed and further future work, automatic music mood detection seems feasible in the near future also at large scale—though certainly with limited mood model complexity.